Starting from January, I will be conducting a special John Woo poll every month(that's if I can come up with a topic). The theme of the poll will be different every month,with a little detail on every options to help some fans who are not too familiar with his works. Which is your favourite leading man for a John Woo film? My favourite leading-man and I'm sure a favourite among many other John Woo fans too.Yun-Fat has starred in many of Woo's better films like The Killer and Hard Boiled. Chow not only looks cool and heroic in Woo's films but also displays great acting ability.An actor who has shown great versatility,Chow also made his mark in many other Hong Kong not directed by John Woo such as All About Ah Long and City on Fire. Although Cage has only collaborated with Woo in one film so far(Face/Off),the actor has shown great interests in working with John Woo and who probably collaborated with Woo again in the future. Nicolas Cage gave a superb performance as the terrorist Castor Troy and often outshines his co-star John Travolta in the film. One of the most versatile actors in Hollywood,Cage now has an Oscar to backed him up which he won for his role as an alcoholic in Leaving Las Vegas. John Travolta is one of the few lucky actors who gets to work with John Woo twice. 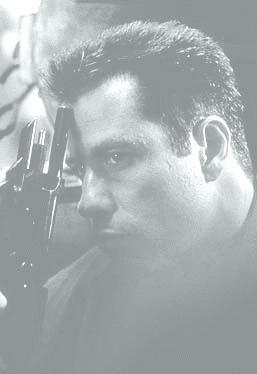 Travolta first collaborated with John Woo in Broken Arrow which he played a military pilot who decides to steal nuclear missiles from the Air Force. Travolta also co-star with Cage in the recent Face/Off which he played hard-boiled cop Sean Archer who is determined to nail down terrorist Castor Troy for murdering his five-year old son. One of the better actors in Hong Kong, Tony Leung also worked with John Woo is two films. Tony Leung starred as one of the three good friends in the powerful drama Bullet in The Head. Tony Leung also gave another fine performance in John Woo's classic Hard Boiled,which he played an undercover cop torn between his job and his loyalty for a trial leader. Ok so Van Damme may not be one of the most talented actors that John Woo has worked with but he is one of the only real action hero that Woo has worked with, besides Dolph Lungdren(Blackjack). I personally think Van Damme was a lot of fun to watch in Hard Target.If you don't mind his limited acting abilities, he can really light up the screen with his fancy kicks and stunts. I really liked some of the moves he did during the fight scenes in Hard Target so I don't really mind should Woo decides to work with Van Damme again.. Maybe that's why I pick him instead of Danny Lee who also deserves a spot in this poll. All right,now on to the votes.I hope you have just as much fun voting as I have coming up with these polls. Monthly John Woo Poll Which is your favourite leading man for a John Woo film?